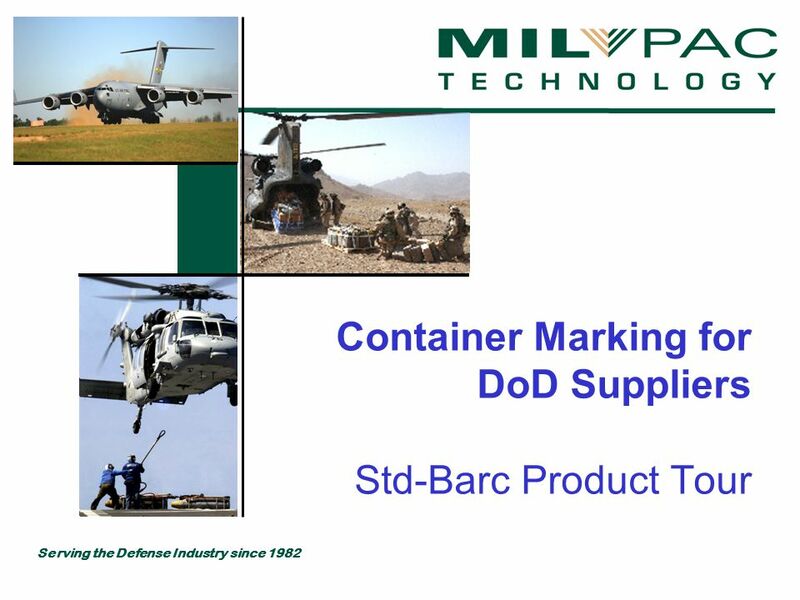 Serving the Defense Industry since 1982 Container Marking for DoD Suppliers Std-Barc Product Tour. 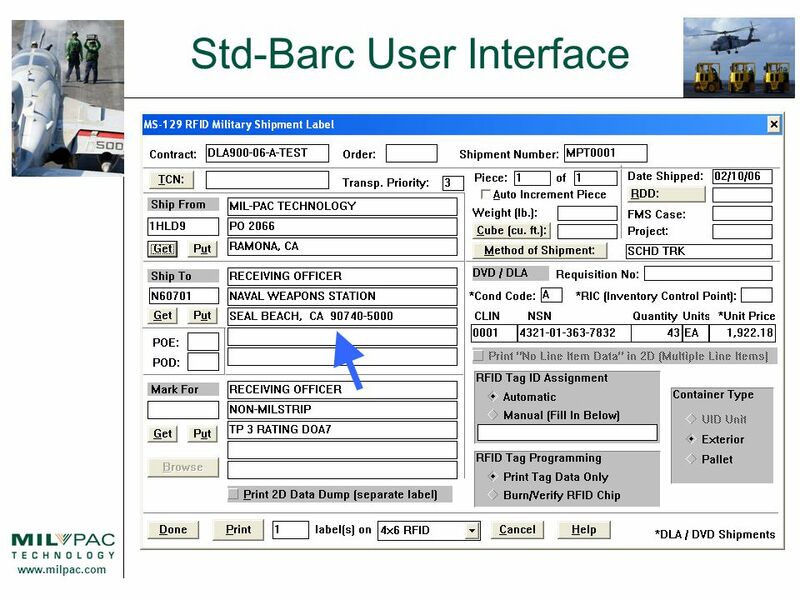 3 www.milpac.com Std-Barc Description Commercial off-the-shelf application software. Currently on third major version. First version released 1982 1,200 installed copies. Built from the ground up expressly for United States Department of Defense suppliers. Optimized for DOD - NOT a general purpose label designer. 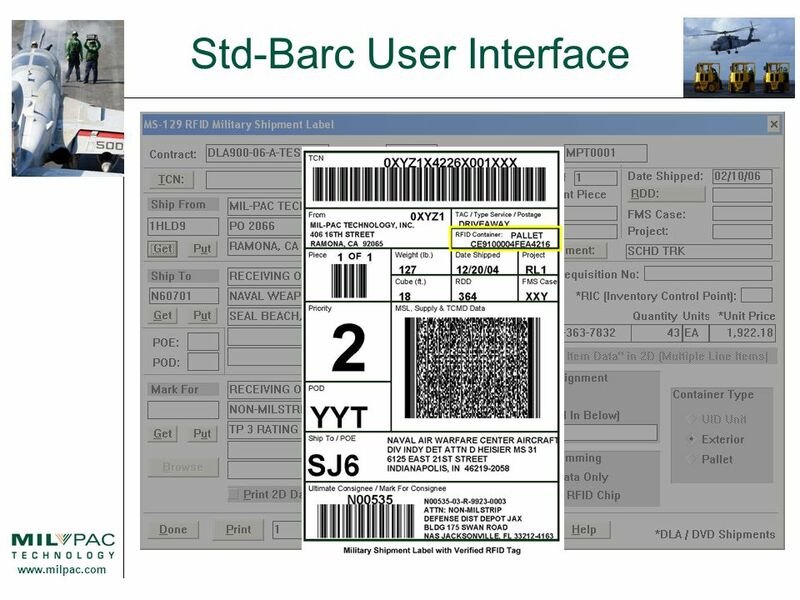 Generates labels compliant with military standards as well as some special purpose and general purpose labels—over 60 different formats. Fully supports new initiatives – RFID, WAWF, UID. Compatible with Microsoft Windows printers (laser, ink jet, etc.) and all major thermal transfer barcode label printers. 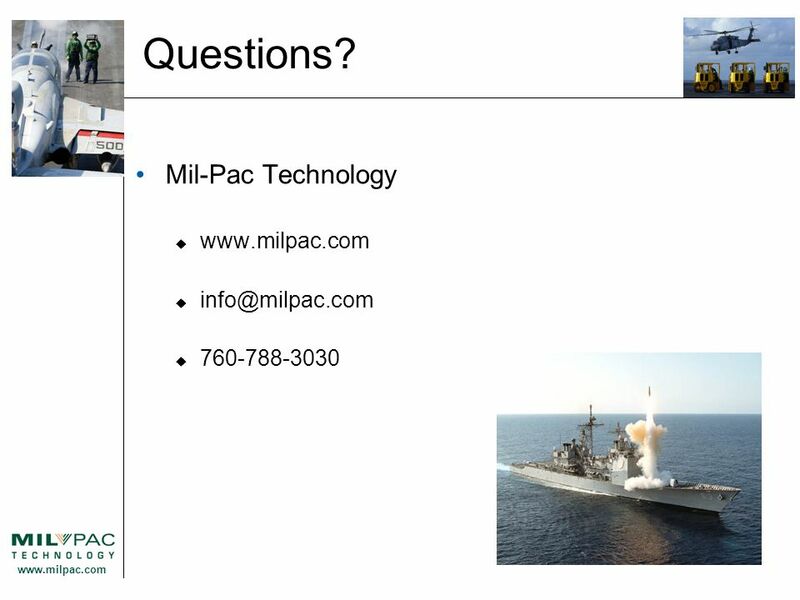 Integrates with other Mil-Pac software and ERP systems. Many user interface helpers and data look-ups. Single user or multiple users. 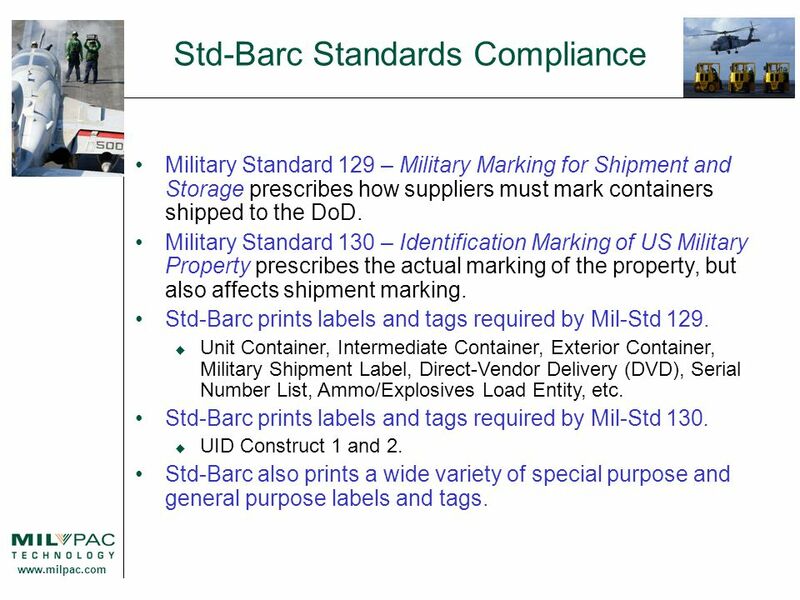 4 www.milpac.com Std-Barc Standards Compliance Military Standard 129 – Military Marking for Shipment and Storage prescribes how suppliers must mark containers shipped to the DoD. Military Standard 130 – Identification Marking of US Military Property prescribes the actual marking of the property, but also affects shipment marking. 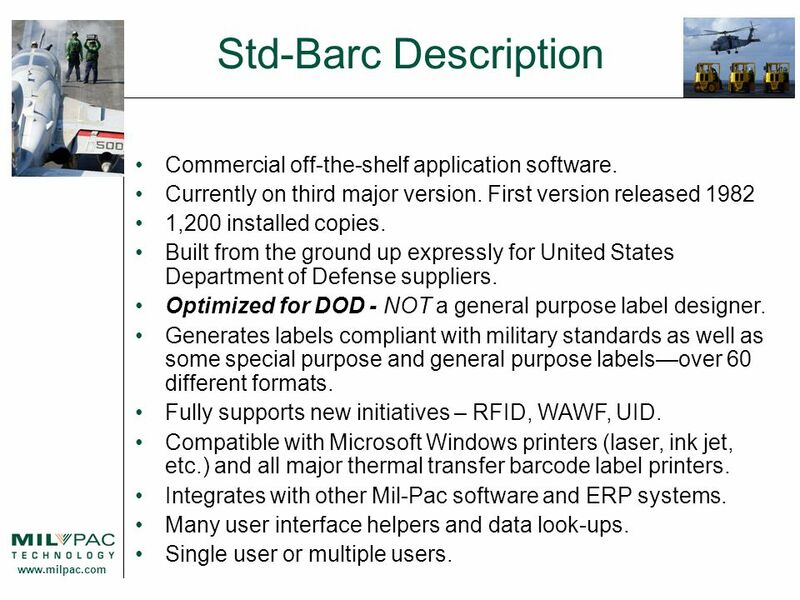 Std-Barc prints labels and tags required by Mil-Std 129.  Unit Container, Intermediate Container, Exterior Container, Military Shipment Label, Direct-Vendor Delivery (DVD), Serial Number List, Ammo/Explosives Load Entity, etc. 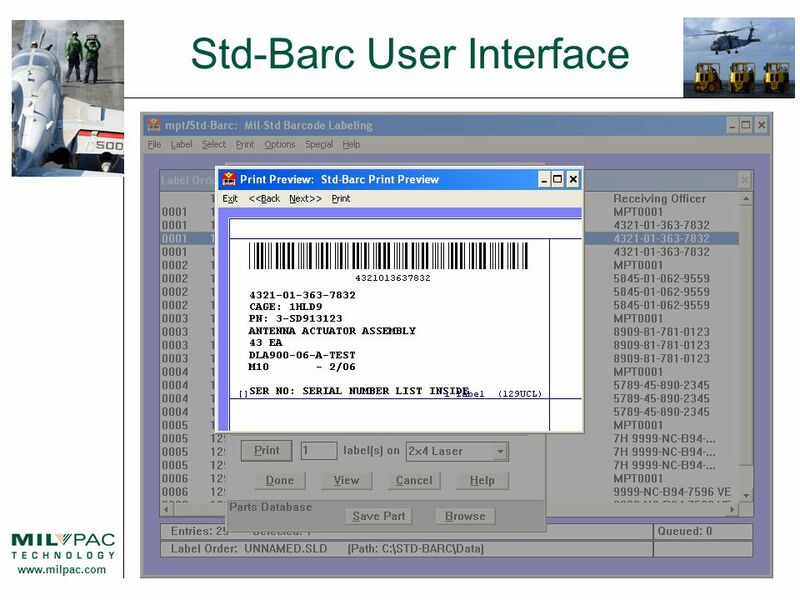 Std-Barc prints labels and tags required by Mil-Std 130. 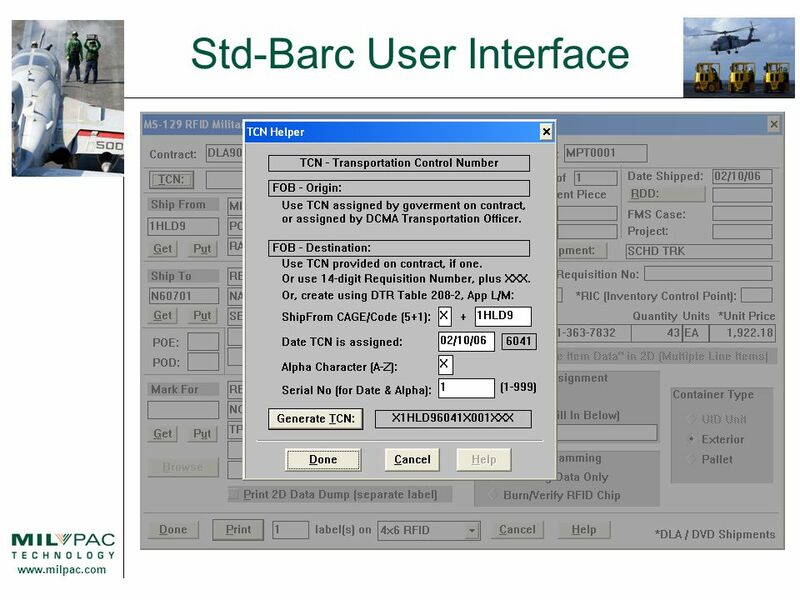  UID Construct 1 and 2. Std-Barc also prints a wide variety of special purpose and general purpose labels and tags. 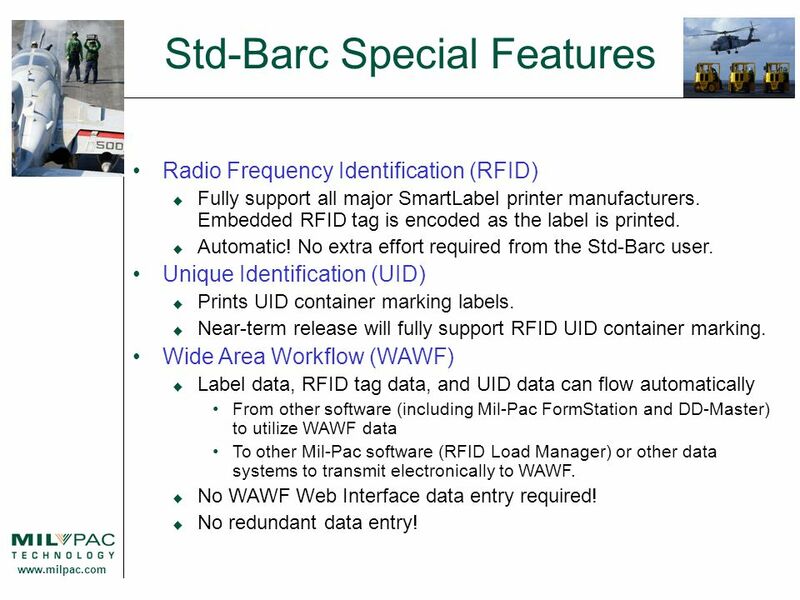 5 www.milpac.com Std-Barc Special Features Radio Frequency Identification (RFID)  Fully support all major SmartLabel printer manufacturers. Embedded RFID tag is encoded as the label is printed.  Automatic! 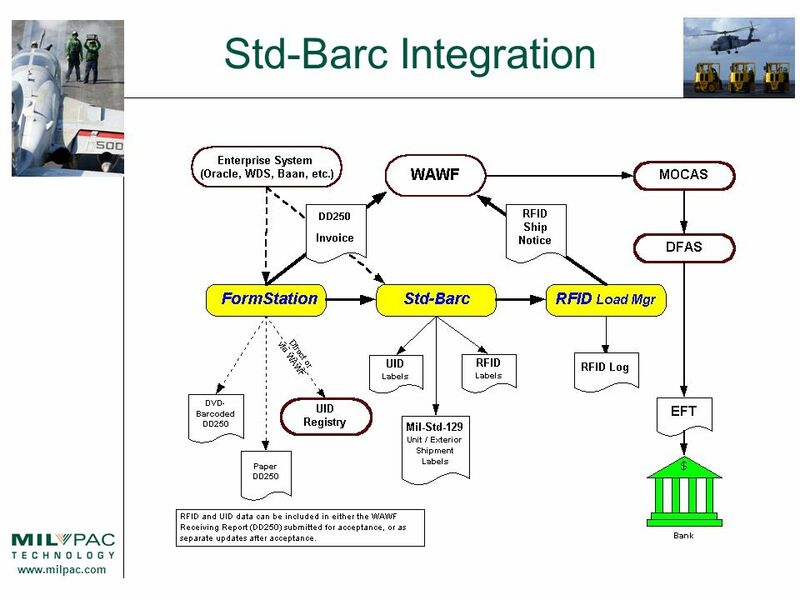 No extra effort required from the Std-Barc user. Unique Identification (UID)  Prints UID container marking labels. 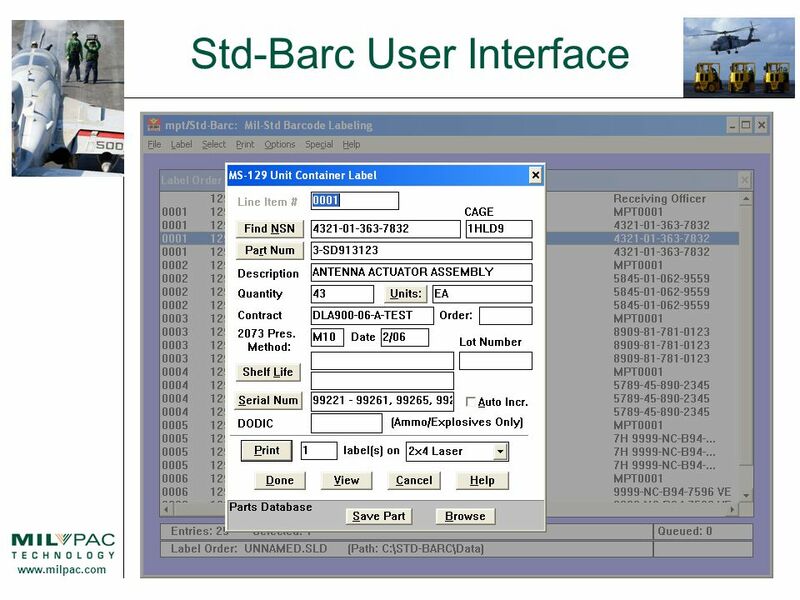  Near-term release will fully support RFID UID container marking. Wide Area Workflow (WAWF)  Label data, RFID tag data, and UID data can flow automatically From other software (including Mil-Pac FormStation and DD-Master) to utilize WAWF data To other Mil-Pac software (RFID Load Manager) or other data systems to transmit electronically to WAWF.  No WAWF Web Interface data entry required!  No redundant data entry! 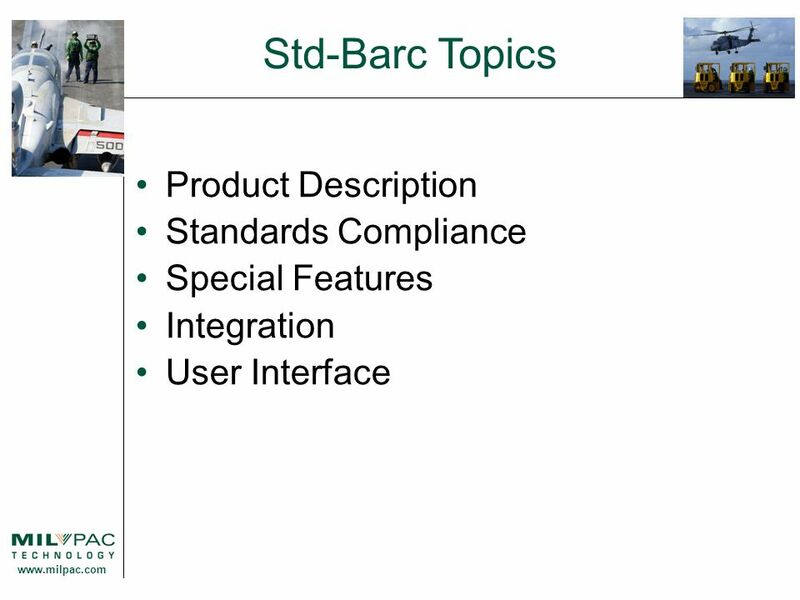 Download ppt "Serving the Defense Industry since 1982 Container Marking for DoD Suppliers Std-Barc Product Tour." Softricity LLC Advance slides with arrow keys. 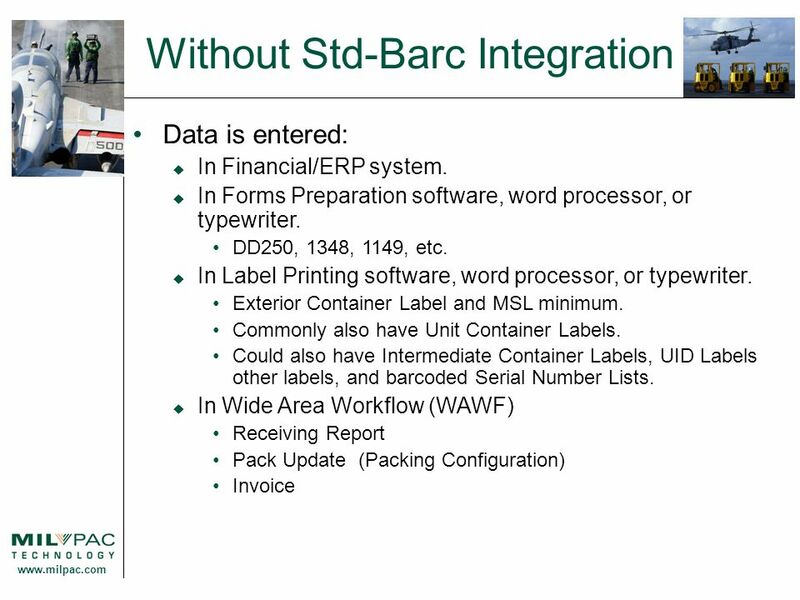 Without PDMLynx Informal processes based upon excel, access, paper files No consistency across organization. 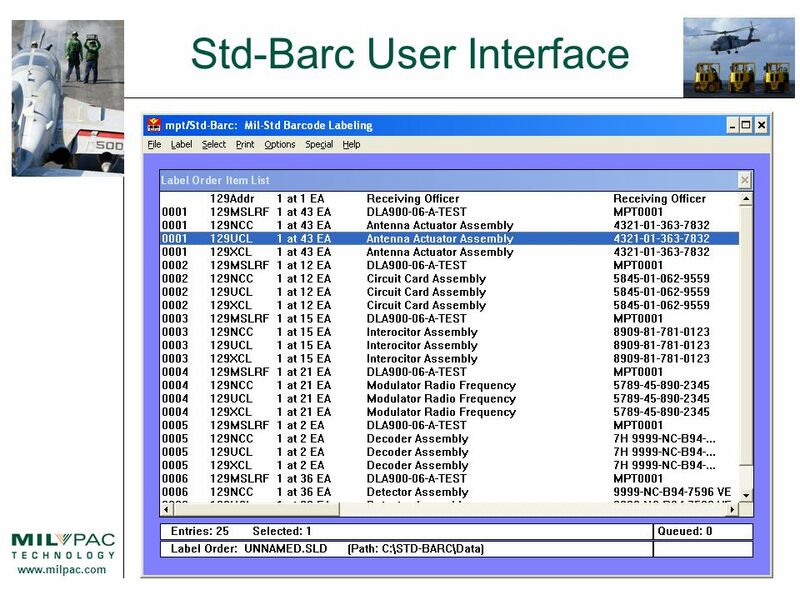 Serving the Defense Industry since 1982 Defense Supplier Solutions Overview Version 1.2. Traffic Manager is a flexible and powerful solution of Traffic and Billing System for radio stations. It also Provides flexible Rate card and Automatic. Course ILT Printers Unit objectives Identify features of dot-matrix printers Install, use, and troubleshoot inkjet printers Install, use, and troubleshoot. VF Access Database VF Access is a stand- alone management tool for tracking inventory of VF-Wrangler garment tags. It is built upon a free-standing Microsoft. 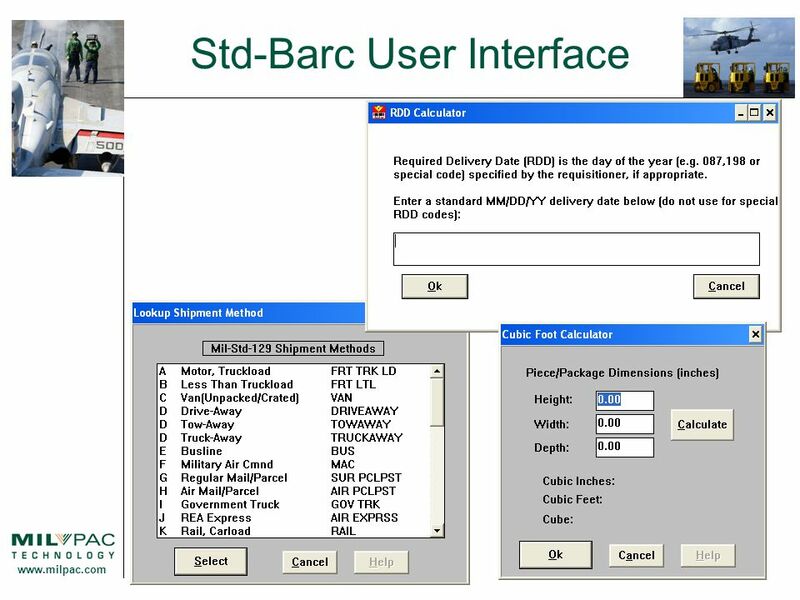 Serving the Defense Industry since 1982 Forms Automation for DoD Suppliers DDMaster Product Tour Version 1.00. Serving the Defense Industry since 1982 Forms Automation for DoD Suppliers FormStation Product Tour Version 1.01. RFID John Wiley & Sons Inc Higher Education Initiative In conjunction with.  Corporate Profile  BOSS Overview  Current Solutions  BOSS Modules  COLORS - New BOSS Web Module  BOSS Benefits  Supplier XML Services and BOSS. PulseHR Time and Attendance software development and coding web development, web hosting IT project management and consulting www.pulsesoft.ro Str. Ghioceilor.